Long before they became the literal and figurative basketball giants of today, Chinese cagers were like any other newbies–inexperienced and with no gold medal to be proud of. Also Read: The World’s First Basketball Stamp Came From The Philippines! In fact, instead of China lording it over us, it was the other way around when the Philippines first joined international basketball. The year was 1913, and basketball in the country was still in its formative years. Nonetheless, the Filipino cagers reigned supreme in the first ever Far Eastern Games–considered to be Asia’s version of Olympics–beating delegates from Japan and China. LEFT: The image of the “New Olympian,” representing Westernized Asians, First Far Eastern Championship Games, Manila 1913 (Source: Philippines Free Press). 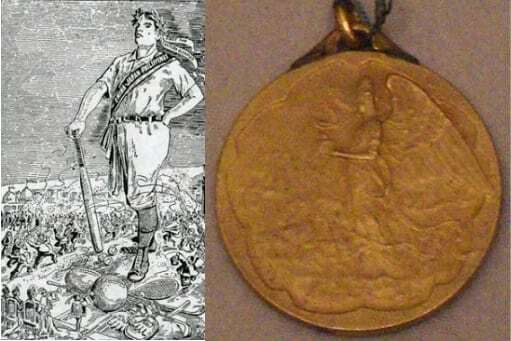 RIGHT: A gold medal depicting an angel symbolizing muscular Christianity, Third Far Eastern Championship Games, Tokyo 1917 (Source: Prince Chichibu Memorial Sports Museum). How China turned things around after that first defeat is beyond the scope of this article, but it provides a perfect backdrop to our nation’s struggle to dominate a sport that clearly favors those with height advantage. Led by Elwood S. Brown, who was also the director of Y. M. C. A. in Manila, the organization was able to convince China and Japan to bring their delegates to Manila and participate in the “First Oriental Olympic Games,” later renamed into Far Eastern Games. And so in 1913, the three countries battled it out at the Manila Carnival Grounds, all armed with a goal to achieve athletic supremacy. The decision to held the games in Manila in February had given the Philippine team a unique advantage. The winter season basically prevented the foreign athletes from training outdoors a few weeks before the scheduled tournament. The homecourt advantage also did help: the Philippine team eventually dominated not just basketball but the entire FE Games itself. Philippines was the overall winner of that year’s athletic meet, and it was all uphill from there. Well, almost. 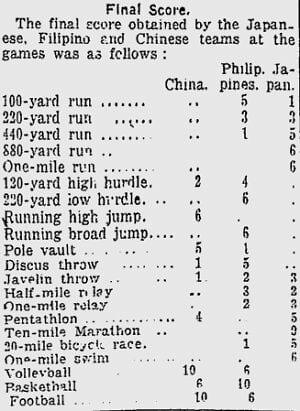 The final scores at the third Far Eastern Games held in Tokyo from May 8 to May 15, 1917. Source: the Toronto World. 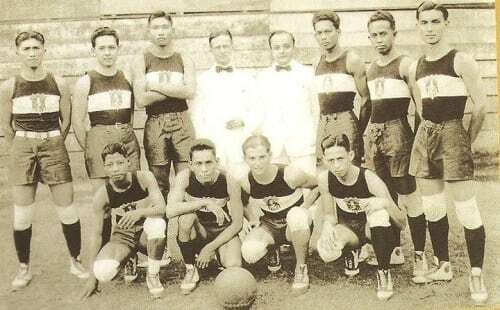 From 1913 until the abolition of Far Eastern Games in 1934 due to a political dispute, the Philippine basketball team won an impressive nine out of ten championships. the Philippines won the overall title in 1921, but failed to seize the basketball crown from the Chinese who beat them, 30-27, due to what others described as “bad officiating.” It was a painful defeat, and our delegates probably promised to train harder next time. And trained hard, they did. The Philippine basketball team came back with a vengeance: the Chinese players were outmatched by Filipino cagers like Lou Salvador whose record-setting 116 points helped them recapture the gold medal in 1923. Philippine Basketball Team of the 1923 Far Eastern Championship Games. Players: Vicente Avena, Augusto Bautista, Aurelio Buenconsejo, Jovito Gonzales, Joanquin Inigo, Elpidio Jose, Eliterio Montelibano, Pedro Robles, Luis Salvador, and Mariano Sangle. Photo Credit: Orlando Lacson/Memories of Old Manila. The end of Far Eastern Games was just the beginning of the Philippine basketball team’s climb to victory. In 1936, they finished 5th in the 1936 Berlin Olympics, an achievement yet to be surpassed by any Asian team. They also dominated the first Asian Games in 1951, winning a gold medal followed by three more: in 1954, 1958, and 1962. Philippine basketball will not be what it is today if not for the pioneers who, aside from dominating the Far Eastern Games, also paved the way for all future Filipino cagers. Unfortunately, not much is known about these players who once defeated the now-powerful Chinese team. 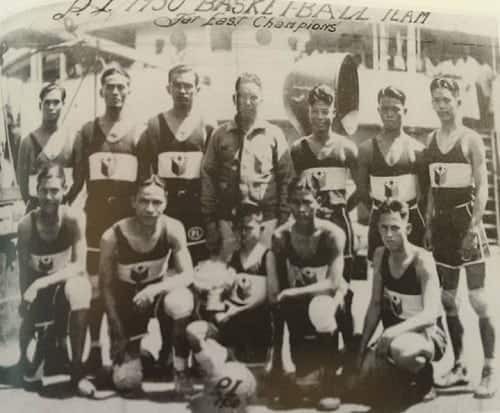 Philippine Basketball Team at the 1930 Far Eastern Games. Photo Credit: Manolo Chino Trinidad/Antonio Delas Alas Collection. A lot of things have changed since basketball first penetrated our society in the early 1900s. The former losers are now the force to be reckoned with in Asian basketball. The victors of yesterday, on the other hand, are now struggling to bring Philippine basketball back to its former glory. Will history repeat itself? Only time will tell. 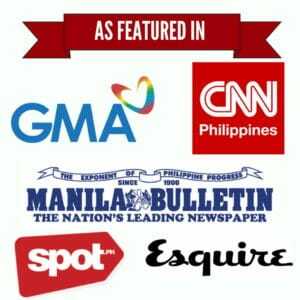 Pingback:Meet The Team Behind Philippine's Success Over China in the Asian Olympics!